The solutions of the quadratic equation -2x2 -20x -30 = 0 correspond to the zeros or the roots of the function f(x) = -2x2 -20x -30. These are the points where the graph of f(x) cuts the x-axis. The graph cuts the Y-axis at -30. The standard form of a quadratic equation is ax2 + bx + c = 0, where "a" does not equal 0. Note that if a = 0, the x2 term would disappear and the equation would be linear. Looking at the given quadratic function a = -2, b = -20, c = -30. The discriminant is positive. Hence, the roots are real and unequal. The quadratic curve cuts the X axis at two distinct points. The function f(x) = -2x2 -20x -30 is the quadratic function. The graph of any quadratic function has the same general shape. This shape is called a parabola. The location and size of the parabola, and how it opens, depend on the values of coefficients in the function. This parabola has a maxima point and opens downwards. The graph of the parabola is symmetric with respect to the vertical line passing through the vertex. The x-coordinate of the vertex will be located at x = (-b/2a) = (-(-20))/(2*-2) = -5.0, and the y-coordinate of the vertex is 20.0 which we obtain by substituting the value x = -5.0 in -2x2 -20x -30. 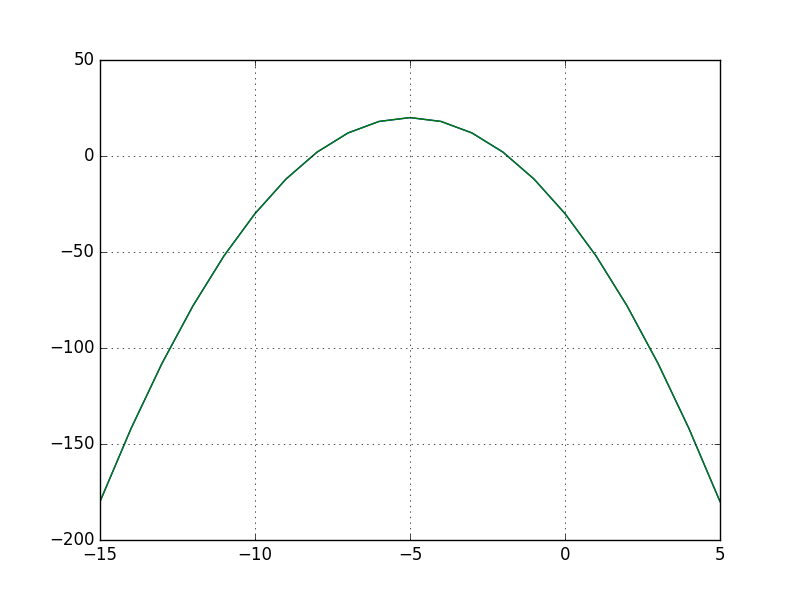 This is the maxima value attained by the quadratic function f(x). The derivative of the function is 0 at this point. This point is a turning point or a stationary point. The solutions of the quadratic equation -2x2 -20x -30 = 0 correspond to the zeros or the roots of the function f(x) = -2x2 -20x -30. As shown in the figure, when the coefficients a, b, and c are real numbers and the domain of f is the set of real numbers, then the roots of f are exactly the x-coordinates of the points where the graph touches the x-axis. The discriminant is positive. Hence, the roots are real and unequal. The quadratic curve cuts the X axis at two distinct points. Check the plot of another quadratic curve here. Here's another quadratic curve here. Many of these concepts are a part of the Grade 9,10,11,12 (High School) Mathematics syllabus of the UK GCSE curriculum, Common Core Standards in the US, ICSE/CBSE/SSC syllabus in Indian high schools. You may check out our free and printable worksheets for Common Core and GCSE.